Hi! 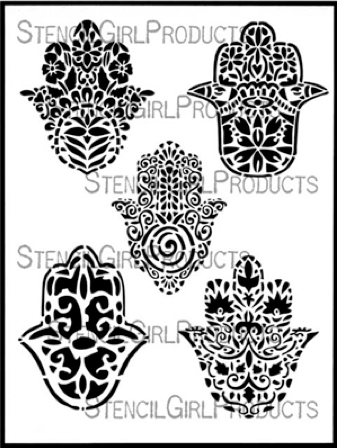 Jessica Sporn here to show you a project for making a house blessing using the Hamsas stencil I designed for StencilGirl. Hamsas are an ancient symbol - predating all the Abrahamic religions. They resemble a hand, that, when shown upright, is said to ward of evil spirits and provide protection. With the fingers facing down, it is said to symbolize the raining down of divine blessings. Either way, it's a good image to have around and is often found in homes. You can read more about the symbolism of Hamsas here. 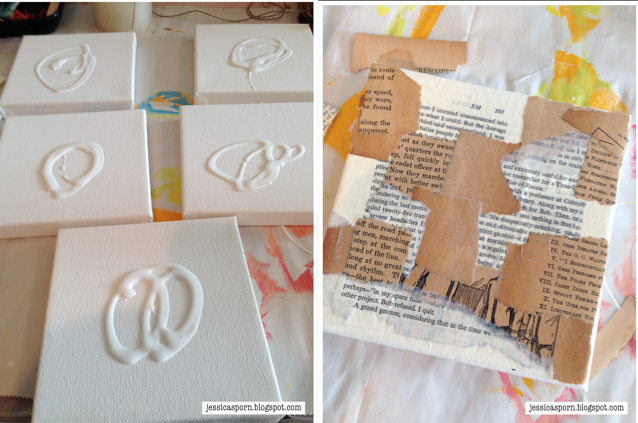 I worked on five 6 x 6 canvases at the same time, and started out by squirting matte medium on all of them, and then adhering bits of book pages and other ephemera I had on my work table. This is a great way of cleaning up your studio! I call it unintentional collage, as it's meant to give texture and interest, and you won't see a lot of it in the end. While the canvases were drying, I made five hearts out of air-dry clay, and stamped into them using various stamps from my stash. May the Lord bestow favor upon you and grant you peace. Even though I knew these words would get covered up, it is important to me, for the intention of the canvas, to include this blessing. But if you don't have the Hebrew Calligraphy stencil, you can always handwrite your own blessings or wishes, or just skip this step altogether! Next I took Golden fluid acrylic paint and mixed it with matte medium to make it even more sheer, and scraped it over the canvases with a piece of a paint chip. This has a little more flexibility than a credit card, and gave the canvases a lot of texture. I took a gelli print that I’d made using the Six Point Starry Night Stencil. I glazed over it so there would not be so much contrast, and then spread Viva Decor modeling cream through the Hamsa stencil using a palette knife. I set it aside to dry. 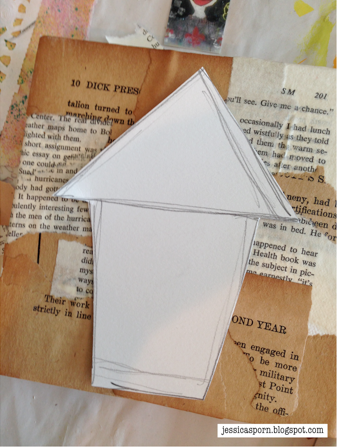 At the start of this adventure, I had cut out a house shape from a piece of card stock. I used it as a mask, and spread Golden molding paste around the outsides of it. Then I glazed the inside of the house shape with a contrasting color. 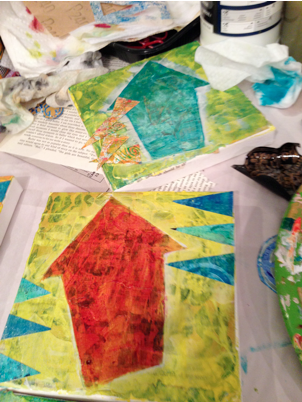 I also cut up some of my gelli print remnants, using a triangle punch. 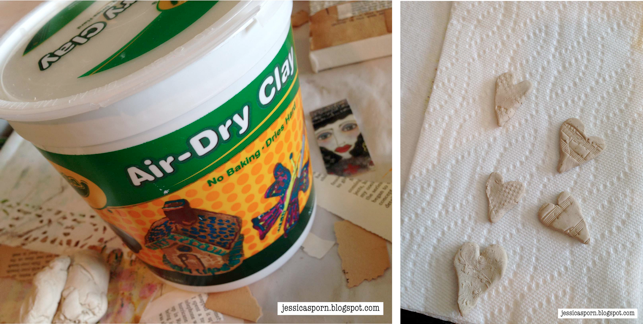 Once the Viva Decor cream was dry on my hamsas, I cut them out and adhered them into the houses used matte medium. I stamped some sentiments from Stamper's Anonymous onto tissue paper and adhered it. I painted and glazed the clay hearts and glued them down. I shaded and added some doodling and stamping, and voila! I hope you liked this project and might be inclined to make a house blessing of your own. I will also be teaching a class in my home studio in September where we will make these home blessings. I plan to create an online class with them soon as well! Please leave a comment here, and on my blog, for two chances to win an original home blessing of your own. This one measures 3 1/2 x 5 1/2" and is made from part of a book cover. I am happy to ship it anywhere in the world! These are beautiful and have great meanings A true house blessing! I would love to be blessed and win one. WOW... fabulous Jessica! Thank you for sharig! Oh Jessica these are so special. Thank you for sharing. so lovely! have to have those stencils! 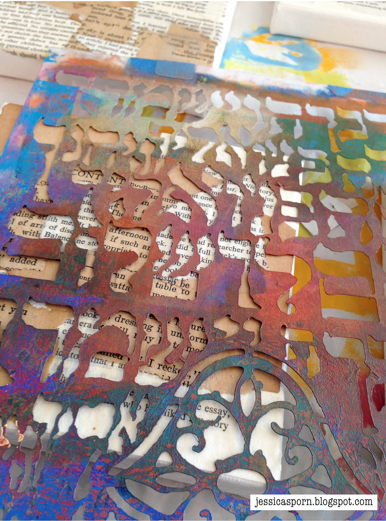 Gorgeous stencils, and wonderful results - yummmmmmmmmmmmmy! Fabulous stencil - I love what you've done - as always!!! I've not come across hamsas before but love the image, and the meaning. Who doesn't need blessings in their home? Frankly, the more the better. Such gorgeous work, Jessica, i love the hidden layers! Thanks for the chance to win one! I love the idea of house blessing painting. The new stencil is amazing. I have learned so much from Jessica Spornm especially about layering. Jessica, these house blessings are an inspiration! I love the way you have incorporated a prayer with the ancient symbol. Jessica... Your canvases are just gorgeous. Love the verse and the symbolic content in the hand signs. Thanks a lot for sharing. Really inspiring art !!! Oh, how I love these stencils and what you have done with them. Thank you so much! Just bought the Hamsa stencil yesterday. The Priestly Blessing is a favorite of our family. I've used your stencil featuring the blessing in some of my artwork. You've probably already picked a winner, but just in case, I would love love love to win one of the little house canvases. I adore your work! Thank you for showing us how you made these! 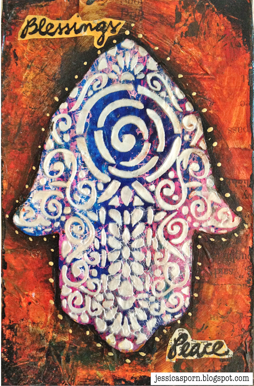 Beautiful canvas's, love this Hamsa stencil, a wonderful gift! Thanks for sharing.